University of California Press, 9780520282643, 288pp. Hollywood Vault is the story of how the business of film libraries emerged and evolved, spanning the silent era to the sale of feature libraries to television. Eric Hoyt argues that film libraries became valuable not because of the introduction of new technologies but because of the emergence and growth of new markets, and suggests that studying the history of film libraries leads to insights about their role in the contemporary digital marketplace. The history begins in the mid-1910s, when the star system and other developments enabled a market for old films that featured current stars. After the transition to films with sound, the reissue market declined but the studios used their libraries for the production of remakes and other derivatives. The turning point in the history of studio libraries occurred during the mid to late 1940s, when changes in American culture and an industry-wide recession convinced the studios to employ their libraries as profit centers through the use of theatrical reissues. In the 1950s, intermediary distributors used the growing market of television to harness libraries aggressively as foundations for cross-media expansion, a trend that continues today. By the late 1960s, the television marketplace and the exploitation of film libraries became so lucrative that they prompted conglomerates to acquire the studios. 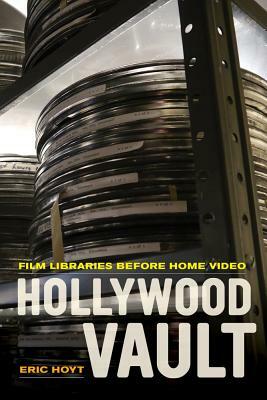 The first book to discuss film libraries as an important and often underestimated part of Hollywood history, Hollywood Vault presents a fascinating trajectory that incorporates cultural, legal, and industrial history. Eric Hoyt is Assistant Professor of Communication Arts at the University of Wisconsin-Madison and co-director of the Media History Digital Library. He designed, developed, and produced the MHDL’s search and visualization platform, Lantern, which received the 2014 Anne Friedberg Innovative Scholarship Award from the Society for Cinema & Media Studies.